Significant pre-Cook first edition of Bellin's world map. Essay d'une Carte Reduite, Contenant Les Parties Connuees du Globe Terrestre. An attractive first edition first state example of J. N. Bellin's 1778 nautical chart of the world. Presents the entire world on a Mercator Projection based on a Paris (L'Isle de Fer) meridian. This is notably the first state of this important map, exhibiting a pre-Cook geography throughout, but most specifically in the Pacific and along the northwest coast of America. In the Pacific, various Polynesian Island groups are noted though many are slightly or significantly misplaced. The Solomon Islands are vastly oversized referencing the early 17th claims of Quiros. 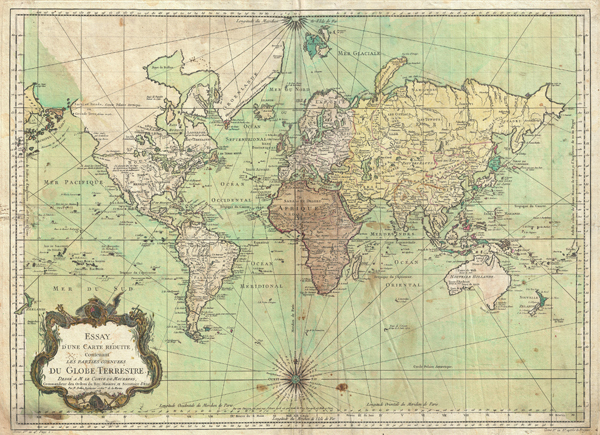 The other lands discovered and erroneously mapped by Quiros in 1606 and Davis in 1686 during their search of the great southern continent are also noted. Hawaii, as yet undiscovered, is absent. New Zealand is rendered twice though is accurate in its form and position. Australia, here labeled 'Nouvelle Holland,' has part of its southern coastline ghosted in and Van Diemen's Land (Tasmania) is attached to the mainland. The southern coast of New Guinea is similarly ghosted in, suggesting its unexplored state. It is of interest that there is a common misconception regarding this map that suggests the first edition was dated 1748. There are editions with a printed date of 1748, but these are actually later editions. The 1748 date is a printing error in which '8' and '4' are transposed, the actual date of publication being 1784. The first edition of this map is the 1778 example shown here. Good. Minor soiling to margins. Light spotting here and there. Original centerfold exhibits some wear. Blank on verso. National Library of Australia, MAP RM 75. NUC pre 1956, V. 470, p. 588.